S = allmargin(L) computes the gain margin, phase margin, delay margin, and the corresponding crossover frequencies for the SISO or MIMO negative feedback loop with open-loop response L. The negative feedback loop is computed as feedback(L,eye(M)), where M is the number of inputs and outputs in L.
For a MIMO system, allmargin returns loop-at-a-time stability margins for the negative-feedback closed loop system. Use allmargin to find classical margins of any SISO or MIMO model, including models with delays. S = allmargin(mag,phase,w,ts) computes the stability margins from the frequency response data mag, phase, w, and the sample time, ts. Find the stability margins of L.
The output S is a structure with the classical margins and their respective crossover frequencies of the negative feedback loop of L.
For this example, consider a MIMO state-space model L with 2 inputs and 2 outputs. Find the classical margins for the MIMO system. The output S is a 2-by-1 structure array of classical margins and their respective crossover frequencies. For instance, S(1) refers to the stability margins of the first I/O feedback channel with all other loops closed. For this example, load invertedPendulumArray.mat, which contains a 3-by-3 array of inverted pendulum SISO models. The mass of the pendulum varies as you move from model to model along a single column of sys, and the length of the pendulum varies as you move along a single row. The mass values used are 100g, 200g and 300g, and the pendulum lengths used are 3m, 2m and 1m respectively. 3x3 array of transfer functions. Find stability margins for all models in the array. allmargin returns a 3-by-3 structure array S, in which each entry is a structure containing the stability margins of the corresponding entry in sys. For instance, the stability margins of the model with 100g pendulum weight and 2m length is contained in S(1,2). For this example, load the frequency response data of an open loop system, consisting of magnitudes m and phase values p measured at the frequencies in w.
Compute stability margins using the frequency response data. The output S is a structure with the classical margins and their respective crossover frequencies. Since allmargin cannot assess the stability for frequency response data models, S.Stable = NaN. To compute the stability margins of the positive feedback system feedback(L,eye(M),+1), use allmargin(-L). To compute margins at the plant outputs, set L = P*C.
To compute margins at the plant inputs, set L = C*P.
L can be continuous time or discrete time. If L is a generalized state-space model (genss or uss), then allmargin uses the current or nominal value of all control design blocks in L.
If L is a frequency-response data model (such as frd), then allmargin computes the margins at each frequency represented in the model. The function returns the margins at the frequency with the smallest stability margin. If L is a model array, then allmargin computes margins for each model in the array. Magnitude of the system response in absolute units, specified as a 3-D array. mag is an M-by-M-by-N array, where M is the number of inputs or outputs, and N is the number of frequency points. For more information on obtaining mag, see Obtain Magnitude and Phase Data and Magnitude and Phase of MIMO System. Phase of the system response in degrees, specified as a 3-D array. phase is an M-by-M-by-N array, where M is the number of inputs or outputs, and N is the number of frequency points. For more information on obtaining phase, see Obtain Magnitude and Phase Data and Magnitude and Phase of MIMO System. Frequencies at which the magnitude and phase values of system response are obtained, specified as a column vector. You can provide the frequency vector w in any units; allmargin returns frequencies in the same units. allmargin interpolates between frequency points to approximate the true stability margins. Sample time, specified as an integer. allmargin uses ts to find the stability margins from frequency response data. For continuous-time models, set ts = 0. For discrete-time models, ts is a positive integer representing the sampling period. To denote a discrete-time model with unspecified sample time, set ts = -1. Gain, phase, and delay margins, returned as a structure array. GMFrequency: All -180° (modulo 360°) crossover frequencies in rad/TimeUnit, where TimeUnit is the time units, specified in the TimeUnit property of L.
GainMargin: Corresponding gain margins, defined as 1/G, where G is the gain at the -180° crossover frequency. Gain margins are in absolute units. PMFrequency: All 0-dB crossover frequencies in rad/TimeUnit, where TimeUnit is the time units, specified in the TimeUnit property of L.
PhaseMargin: Corresponding phase margins in degrees. DMFrequency and DelayMargin: DelayMargin is the maximum amount of delay that the system can tolerate before it loses stability. DMFrequency contains critical frequencies corresponding to the delay margins. Delay margins are specified in the time units of the system for continuous-time systems and multiples of the sample time for discrete-time systems. Stable: 1 if the nominal closed-loop system is stable, 0 if unstable, and NaN if stability cannot be assessed. In general, allmargin cannot assess the stability of an frd system. When L is an M-by-M MIMO system, S is an M-by-1 structure array. For instance, S(j) gives the stability margins for the j-th feedback channel with all other loops closed (one-loop-at-a-time margins). allmargin assumes that the system with open-loop response L is a negative-feedback system. To compute the classical stability margins of the positive feedback system feedback(L,eye(M),+1), use allmargin(-L). 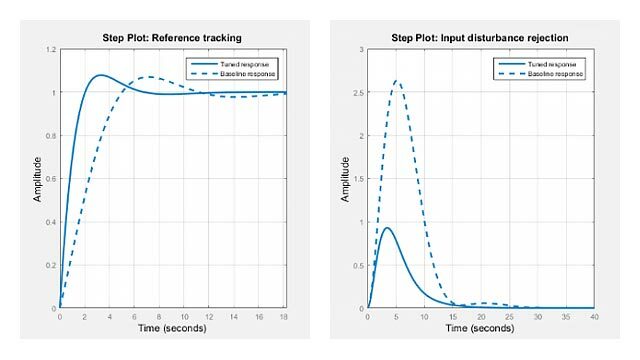 To compute classical margins for a system modeled in Simulink®, first linearize the model to obtain the open-loop response at a particular operating point. Then, use allmargin to compute classical stability margins for the linearized system. For more information, see Stability Margins of a Simulink Model (Robust Control Toolbox).